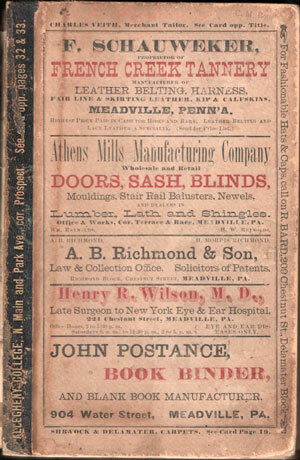 Published by N. H. Burch & Co., Meadville, PA. 1880-81. Covers are off but present. No spine name strip. First two ad pages are loose. Inside pages are overall nice and clean. A directory of residents of Meadville in 1880-81 listing name, occupation and address. Hardbound, 285 pages. Also includes numerous business ads.